New louvers offer a lot of benefits but there are big considerations to be had before you make the decision to install them. There are many benefits to installing louvers on your property, but before you make your final decision, it’s always good to ask the right questions. There are a ton of factors that go into a costly decision like this, so it’s important to be aware of all of the facts. Thankfully, picking the right louvers for you isn’t all that difficult. Let’s take a look at some major considerations you want to make yourself aware of before choosing to install louvers. While fences are offered in a few materials from iron to wood, louvers are typically aluminum. This is because it offers weather-resistance while still being a durable, strong material that won’t degrade in quality any time soon. Aside from having to clean your louver and possibly clean up any landscaping around it, you won’t need to do much. This is ideal for any businesses who don’t want to have to deal with regular maintenance. Commercial properties are always looking to find the right ways to protect themselves. Fences are another fantastic option for doing so, it just depends on what’s more important to you. If you’re protecting something that benefits from airflow, like a generator or an air conditioning unit, louvers may be an option. 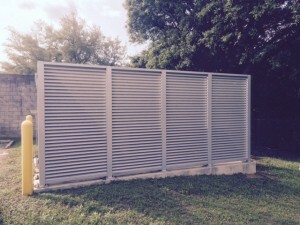 Louvers also traditionally offer more privacy. However, fences have their own benefits as well and some people may find them to be more aesthetically pleasing. Remember that your louvers or fence are subject to the area around you as well. You may want to consider neighboring businesses and talk to them beforehand to make sure everyone is on the same page. Additionally, make sure your louvers are in accordance with local laws and codes as it can be costly to have to take them down later. If you’re uncertain, work closely with your professional louver installer to make sure everything is in accordance with regulations. This entry was posted on Friday, July 6th, 2018	at 3:22 pm	. You can follow any responses to this entry through the RSS 2.0 feed. Both comments and pings are currently closed.